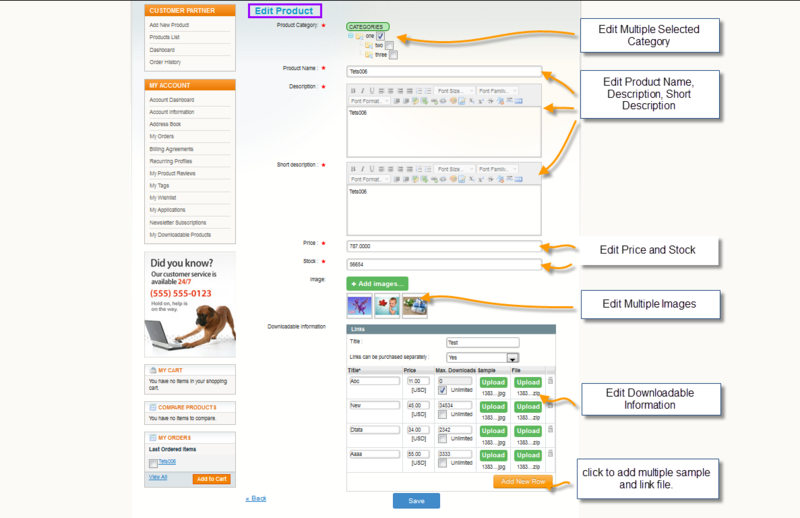 Magento customer partner(downloadable) module is quite flexible in functionality and works out of the box. This module allows you to convert your Magento store into proper sale purchase site. Here customer’s of the store can upload and sell their products too. Any Customer can become a Partner of the Admin. Customers can add Downloadable products. Customers can see the Order history. Customers can see the Product list. Admin has the rights to Approve the Customer and his Products. 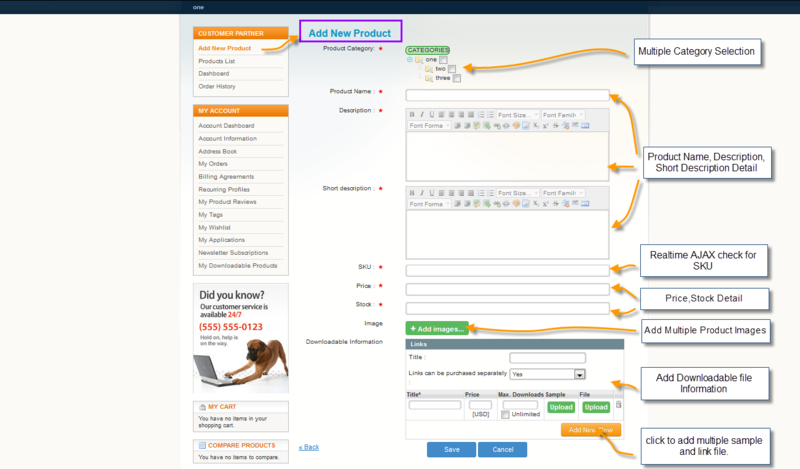 Installation of the customer partner(downloadable) module is very simple after downloading the customer partner(downloadable) module from this URL http://store.webkul.com/Magento-Extensions/Magento-customer-partner.html unzip the customer partner(downloadable) zip. Now you will find the app and skin folder inside that. Move that app and skin folder in Magento root as per the screenshot. Go to your FTP directory where you installed Magento then find “app/design/frontend/default/default/template” folder and copy “customerpartner” folder and paste into “/app/design/frontend/your_theme_name/default/template” folder. Then copy “customerpartner.xml” file from “app/design/frontend/default/default/layout” folder and paste into “/app/design/frontend/your_theme_name/default/layout” folder. Go to “skin/frontend/default/default” folder,copy “customerpartner” folder and paste into “skin/frontend/your_theme_name/default” folder. After the successful installation of the Customer Partner(downloadable) module, you will be able to see the configuration panel under System > Configuration as per the below screen. As per the above screenshot you can see admin configuration parameters for customer partner. Let’s explain each parameter one by one. Percent % per product sale is the global commission which seller needs to enter, this commission mechanism will be applicable for all the sellers. Let’s say as an example there is a seller S1 and his/her product(P1) price is 100 USD. So on the sale of product P1, the seller will get 80 USD and admin will get 20 USD as commission. Product Approval Required by this option admin can restrict automatic approval of the product. e.g if seller adds a product every time product will be moderated by admin, the store owner can set YES or NO. Partner or seller approval is the same as product approval, during sign-up of the seller if admin allows this option then a user who will sign up in the store as a seller will convert into seller automatically. The store owner can set YES or NO. Admin can enter their email id for receiving all notification. Attribute Set ID is the attribute set ID for your global catalog by default this is set to “Default”. That’s why in the screenshot it is showing as default. Admin can select attribute set from dropdown menu. Here you can enter the file extension which is allowed at front-end to upload an image file e.g. .jpeg, .png etc. Here you can enter the file extension which is allowed at the front end to upload a sample file e.g. .zip, .rar etc. Seller sign up is very easy. Users can sign up for the seller using My Account link and during sign up, if they want to sign up as a seller then they need to choose YES else NO from the drop-down list, as shown in the screenshot below. If the user has been approved as a seller then the customer partner block will display in My Account section of the user as per the images. Under this menu, seller can add their products with many attributes as per the Magento admin. The Seller can enter the product name, description, short description, price, stock, upload multiple images and downloadable file details. Also, proper validation has been applied for seller product add screen with live ajax check for product SKU. After successfully product addition (if in the module admin product moderation is set NO then product will be approved automatically ) seller can edit or delete the added product and can manage the products under My Product List. Using this menu seller can manage their product like they can update their product, delete their product can track their product sales and can manage their stock. As you can see there is an Edit button which will show the Edit Product page for product added by the seller as per the screenshot. Using seller dashboard seller can track his sales using an interactive chart, recent orders and recent comments with total sales matrix. 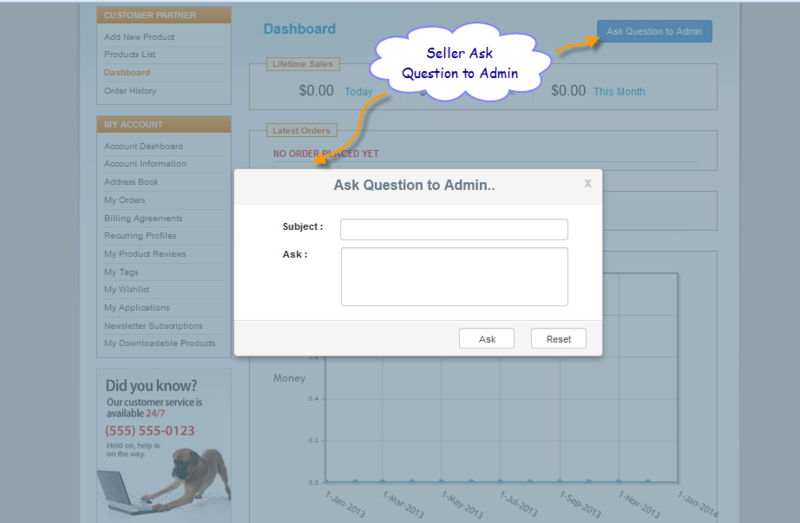 Sellers can ask questions or doubt directly to the admin from My Dashboard. Using this link seller can see their products order history in one shop. Order History comes with pagination as per the screenshot. This menu is responsible for seller product management if from customer partner configuration panel (System > Configuration > Webkul) product approval is required then in this case every product added by seller need to be approved by admin. Product approval will happen from manage product menu as per the screenshot. You can see there is a prev button which will show the preview screen for product added by the seller as per the image. This menu is responsible for seller management if from customer partner configuration panel (System > Configuration > Webkul) partner approval is required then in this case every seller need to be approved by admin. There is an action drop down menu by which admin can make a pending customer to the seller and vice-versa. As you can see a column order when admin will click here it will display all the order of the particular seller as per the screen. 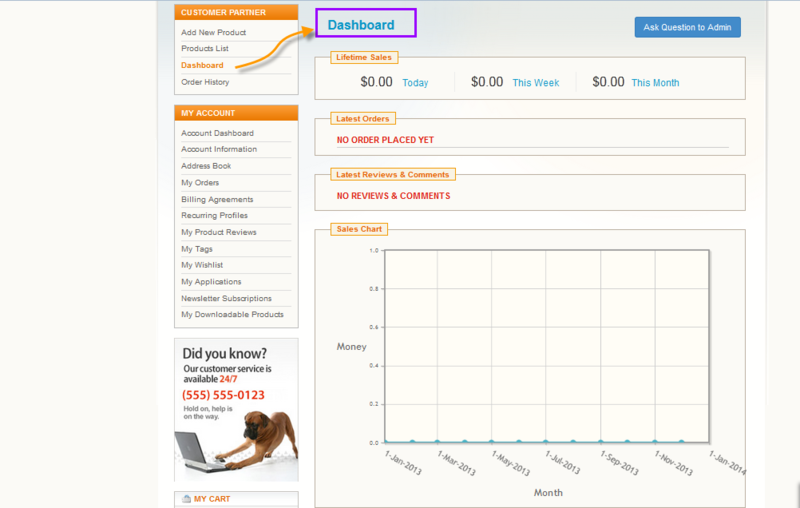 By clicking on any order admin can view the complete order of that seller. Here Mode of payment is the payment details added by the seller from My Account > Seller Information. It can be anything let’s say bank account number or PayPal id. Manage commission menu is responsible for all the commission management despite of the global commission. There is an individual seller commission by which admin can set different commission for different sellers. Pay action in the grid will clear the payment for the particular seller. Let’s say Seller S1 have a remaining amount 100 USD then after the pay button has been clicked that means seller have already sent the payment now he / she is going to clear it (no actual payment with any payment gateway will happen here this link is for calculation only). This column is for per seller commission display.